Rethink and Molson Canadian are back and bigger and better than before … with an inspiring group of hockey fans who took their love of hockey to the next level to show how they’d do #ANYTHINGFORHOCKEY. 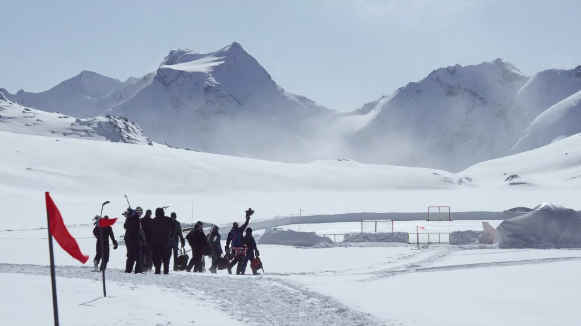 This epic spot, featuring an exhilarating game of hockey played on Molson’s iconic rink in the mountains, was edited by Marc Langley and directed by Untitled Film’s Tyler Williams. According to Langley, it was all fun … as his skillful edit takes the story to a new level; from the helicopter pad face off, to the winning game goal, to the Molson Beer Fridge hat trick, right on through to the overtime surprise ending for the fans. This entry was posted in advertising, Alcoholic Beverages, Beer, Beer Advertising, Commercial Editing and Post, commercial post production, commercials, creative ads, editing and post, Hockey, LifeStyle, popculture, television, Travel & Events, TV Campaign, TV Commercials, Uncategorized, Winter and tagged #AnythingForHockey, #BeerAds, #BeerFridge, #EpicRink, #Hockey, #MarcLangley, #Molson, #MolsonBeerFridge, #MolsonCanadian, #MolsonCanadianBeerFridge, #Rethink on April 2, 2015 by Rooster Post Production. An interesting read on how some Canadian brands have taken their branded content to the next level. What does it take to really break through? It looks like great creative is still the way to go. We’re pleased that they’ve included 4 projects that we worked on: Dave De Carlo & Drew Stevenson for Dempster’s, Marc Langley for Molson’s Beer Fridge, Paul Jutras for Volkswagen’s Once More: The Story of VIN 903847 and Dave De Carlo for VW Beetle 3 Track – Gang of Rhythm. This entry was posted in advertising, Commercial Editing and Post and tagged #BrandedContent, #Dempster's, #Molson, #RedUrban, #roosterpost, #untitledfilms, advertising, CommercialEditingAndPost, Volkswagen on March 7, 2014 by Rooster Post Production.